The work was done on diamond topped with a layer of zinc oxide containing electrical conductors and performed at a temperature of 8 degrees Kelvin (-445.27 Fahrenheit, -265.15 Celsius)—just above absolute zero. Using sound waves known as surface acoustic waves to change electron states could foster data transfer between quantum bits, the researcher said. The interaction of qubits, as is the case with binary bits in current computing, is seen as vital in building advanced systems. The research is detailed in a paper placed online April 7 by the journal Physical Review Letters. "Computer chips in today's systems are based on electrical circuits," said Hailin Wang, a professor in the UO Department of Physics and member of the Oregon Center for Optical, Molecular and Quantum Science. "What we have accomplished could lead to a new architecture—a new way—to design a computer chip. Instead of using electrical circuits we incorporate sound waves on a chip, with our eyes on acoustic circuits and also on potential applications in tomorrow's quantum computers." The research focused on a goal of quantum-computing research—taking advantage of defects in diamond known as nitrogen vacancy centers, where a nitrogen atom substitutes for a carbon atom adjacent to a missing carbon atom. These defects are, in effect, artificial atoms that can be used as qubits. It is in these centers where scientists want to harness control of the spin, or electron states, of qubits. Wang's lab is among many around the world looking to incorporate sound waves. 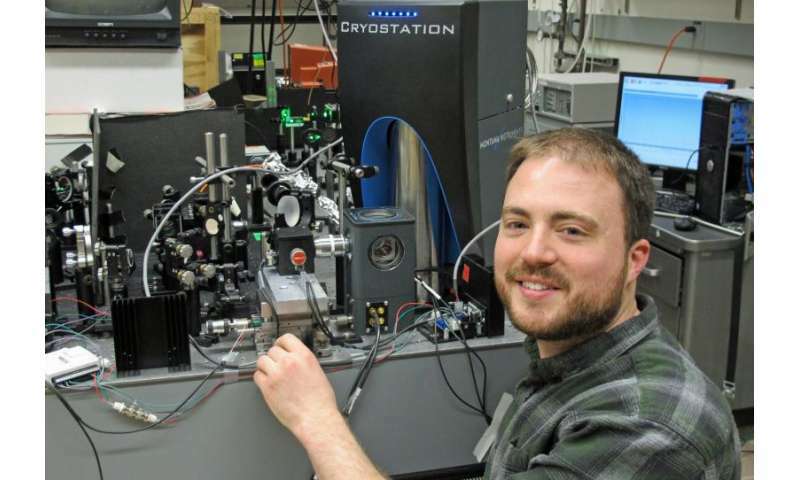 "We've brought in sound waves that we can drive into the diamond itself," said the study's lead author D. Andrew Golter, a research associate in Wang's lab. "We can tune the pitch to just the right frequency that lets us control the quantum state." To add sound waves, researchers built a tiny speaker on the surface of diamond. Sound caused the diamond and zinc oxide layer to crunch up and expand back and forth. The sound wave travels across the surface of the diamond and interacts with the NV center. There, the researchers used lasers to monitor light being emitted, which allowed them to confirm electron states had been changed. "You want qubits to be either on or off," Golter said. "We use sound and light to switch them between different states. Light works well for some contexts, but it is sometimes hard to work with. If two qubits are in different locations and we want them to talk to each other, it is difficult to get light to go from one to the other. Light moves fast and can be hard to control. Sound is much slower, and it is easier to make it travel within this material because it automatically travels through solid matter." In essence, using this new tool based on both light and sound can help create logic gates—the building blocks of digital circuitry—that serve to let qubits talk with one another, Wang said. "You can, in principle, use the sound waves to entangle two qubits," he said. "For quantum computers you need this." For a solid material such as a chip, sound may be an ideal tool for building a network of interacting atoms, with sound waves carrying information from one atom to the next, Golter said. "For basic physics and for potential technological applications, we want to have tools to control single atoms in really tiny systems," he said. "Our approach has advantages. Sound is slow compared to light. Sound is confined to the chip. It would be a good way to do operations inside the solid material. We've shown this with a single artificial atom, which now means we should be able to build up to multiple artificial atoms using sound to network them together." FYI: In their setup the SAW center freq ~900 MHz. ; they used sputtered piezoelectric ZnO films as the acoustical transducers.